We’d love your help. Let us know what’s wrong with this preview of Le sourire étrange de l'homme poisson by Tom Avery. Ned est mon frère jumeau. Mais Ned est malade et j'ai peur. Aujourd'hui, nous avons trouvé une créature étrange sur le plage et je suis sûr que ce n'est pas un hasard. Est-elle venue pour sauver mon frère ? 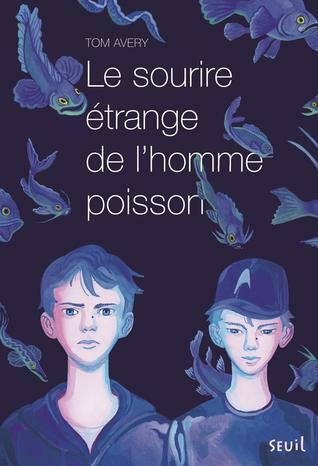 To ask other readers questions about Le sourire étrange de l'homme poisson, please sign up. Ondanks dat dit boek iets meer voor jongere kinderen is, heb ik erg genoten van dit boek. Wat een prachtig verhaal! Alweer een heel mooi veerhaal van Tom Avery! Recensie zal verschijnen op mijn blog. This my my review on the book, "Not As We Know It" by Tom Avery. I really enjoyed this book, as it is filled with mystery and wonderful tension like feeling which glued me to the story. This book is more on the short-read side of books, as it has 159 pages. The book has events which pass by quickly, but they very welly executed and they make the story great. The way this story was built was a perfect way to put them together and make a great story. This book is about a two brothers, Jamie and Ne This my my review on the book, "Not As We Know It" by Tom Avery. I really enjoyed this book, as it is filled with mystery and wonderful tension like feeling which glued me to the story. This book is more on the short-read side of books, as it has 159 pages. The book has events which pass by quickly, but they very welly executed and they make the story great. The way this story was built was a perfect way to put them together and make a great story. This book is about a two brothers, Jamie and Ned, who love to explore. They live pretty much right on a beach, and they love to head down there especially after storms to see what they could find, hoping for treasure and other interesting things. They both love to go on adventures together, and there is a strong connection between them. Although, they both do not go to school because of an issue Ned has, which causes him to continuously always be coughing, and he has gunk in his lungs and all that sort of stuff. The two also love star trek, and Ned loves to repeat his favorite quotes from the shows, and him and Jamie compare him to Captain Kirk, who is a brave character from star trek. Ned is very brave, and he does not have much caution about things, as Jamie seems to have. Anyway, while exploring the beach one day, they had really found nothing util Ned spots a mound of seaweeds on the shore. They decide to check it out and find a mysterious creature, which looks like it has the features of a fish and a human. The brothers decide to take it home and keep it in a tub in their garage. The brothers feed it fish, and Ned becomes very comfortable around the strange creature. The brothers Granddad was a very successful fisherman, and he tells the boys stories of mermen and myths about them. The brothers kept their fishy friend secret, but used their Granddad's stories to try and help them try and determine what the creature is. Jamie soon believes that the creature came to help cure Ned, as his illness got worse and worse. But Ned has a plan, which is much different than Jamie's. Jamie misses school to always be with Ned because he has always feared the risk of losing him when he is not there. After Ned could no longer go to school, they kept Jamie in but would always run away and come home. So his parents decided they might as well keep him out too. Since then, they have always been together and they were best friends. So once they found this creature, Jamie hoped that according to the stories that he had come to heal Ned. But Ned has gone to the doctor with his parents for check ups often, and it looked like there was not much hope remaining for Ned. Ned also tells Jamie that this creature would be their last adventure, and Jamie struggles with this idea. Jamie does not know the kind of plan Ned has planned, but the creature and Ned seem to know everything they have to do. The theme of this story is mostly pretty much friendship between the two brothers and their adventures. There was so much behind this whole creature that they found. Their Granddad had told them ancient stories of how sailors have been sick on their ships with no hope, and then they disappear all of a sudden. There are rumors that those sailors joined the world of the mermen. Ned and the creature have a connection and know that Ned's story would end like the sailor's. But the theme really is friendship, because really do every thing together and Jamie never wants to let Ned go, and so doesn't Ned, but Ned does have a plan. So pretty much in the end, once Ned is really sick, he doesn't have much time and Jamie waits upon a miracle from the creature. But Ned tells Jamie that he doesn't have much hope, and that all the people in the stories never made it. Jamie does not want to believe this and he becomes very sad. Anyway they both agree that it is time to finally let go of the creature and release him to his true home and to his family out in the depths of the sea. That night their mother had told them to stay home, as Ned needed to be kept warm and inside. But that night Ned left out to the sea without Jamie, and Jamie then wakes to find Ned had gone just a bit ago. So he hops on his bike and races after Ned, and even a police officer comes after them, and he does know the boys very well, but he followed them to see what he was up to. He then sees Ned jump into the ocean with the creature. Jamie dives in and never finds Ned again. His family was devastated and they had the coast guard search and search but they never found him. Jamie never tells his family about the merman because he thought they would never believe him and think he'd gone mad. Jamie is devastated by this as he never understood what Ned had. This story was told through the first person view of Jamie, which really had a huge effect on the story. This is such a big factor in the story because it gives the reader all the access to what Jamie is thinking, but it really gives the reader tension too because we cannot see what Ned know about the creature obviously, and that is what holds the story together. We could see the emotions that Jamie has about Ned, and that is a huge factor to making the story great. If it had been from Ned's point of view the story would be completely different, and that is not in a bad way. We would have sooooo much more information but still lots less since we wouldn't know about Jamie's feelings. So I really think the Point of view of the story had a big effect positively and negatively in some ways. I really like how well the author used his sequence of events for the story. The story always had me glued to it, and there weren't many points where I was sick of reading it, and that just shows the book is a success because readers are locked in. The author adds the perfect amount of tension to the story, especially when Ned jumps into the water and is saved by the cop. (Not included in my review) and other such events which readers usually like and stay entertained with. The end of the story was also very well done, which in all books I think is a crucial part to get right or the whole book is ruined. I would definitely give this book a good 4-5 star rating and recommend it to anyone. To be specific, if you want a great short read book, by short read i mean not close to harry potter length and around under 200 pages. The story had a great foundation and it had a great ending. This book is a great book to read for anyone really. So that was my review on "Not As We Know It" and hopefully it inspired u to read it! HAVE A GOO WUN! Un roman qui parle de la mer et de la famille. Tout ce que j'aime. C'était doux, poétique et plein de finesse. Bouleversant, mais vraiment bien. Jamie and Ned are twins growing up together on a tiny island in the English Channel. They love to do things as a pair, from scouring the beaches for treasures that wash up from the sea to watching Star Trek on DVD. But Ned is not well. He is fighting cystic fibrosis and the most recent treatments don’t seem to be working. Then one day, the brothers find a strange creature on the beach. It is hurt and they carry it to their garage where they fill a tub with saltwater and care for it. It’s like no Jamie and Ned are twins growing up together on a tiny island in the English Channel. They love to do things as a pair, from scouring the beaches for treasures that wash up from the sea to watching Star Trek on DVD. But Ned is not well. He is fighting cystic fibrosis and the most recent treatments don’t seem to be working. Then one day, the brothers find a strange creature on the beach. It is hurt and they carry it to their garage where they fill a tub with saltwater and care for it. It’s like nothing they have ever seen before with its scales and gills combined with arms and legs. As the boys care for the creature, their grandfather tells them tales of mermen and mermaids. Jamie starts to hope that the creature can work a miracle for Ned, though Ned sees it very differently. Lovely story with quality writing. Think would be best for grades 4 - 6 - though, as true with so many books in this age group, heartbreaking. I appreciated the honesty in thinking about how the twins related to one another and the needs of each. Recommended it for a grade 4 classroom read aloud so am interested to learn how this goes. May update my feed post listening. I liked it but I wasn't crazy about it. The story is a beautifully sad tale of two twin brothers, their relationship and their adventures together. You really get the feel of the place where they live near the beach and what their life is like. I think my favourite character was the Grandad, his tales of past times really resonated with me as my Grandma loves to tell me tales of her town and the people who live there. I liked the Star Trek quotes throughout the book, I don't know how a person wou I liked it but I wasn't crazy about it. The story is a beautifully sad tale of two twin brothers, their relationship and their adventures together. You really get the feel of the place where they live near the beach and what their life is like. I think my favourite character was the Grandad, his tales of past times really resonated with me as my Grandma loves to tell me tales of her town and the people who live there. It was a short read but pleasant read...found it a poetic style musings of a boy emotionally dealing with two major unknowns in his current life. The unknown health of his brother and the unknown place he;ll be going to and the creature from an unknown place that ended up int heir known world plus learning to live to through this situation. This felt very similar to the author's previous book. Very sad. A quick read and likely helpful to kids trying to understand grief/sickness. Thanks to the publisher for a digital advance reader's copy, provided via Edelweiss. This is a middle grade novel about letting go. Twin brothers, Jamie and Ned, live on a small isle along the English Channel in the 1980s. They love Star Trek, ET, biking, exploring, adventures, the sea, and treasure hunting (beach combing after storms). They learn a lot about the sea and geography from their grandfather who used to be a ship captain. Ned has cystic fibrosis, his health condition continues to worsen. Despite this, as Jamie will admit, he is the bolder of the twins. Jamie says tha This is a middle grade novel about letting go. Twin brothers, Jamie and Ned, live on a small isle along the English Channel in the 1980s. They love Star Trek, ET, biking, exploring, adventures, the sea, and treasure hunting (beach combing after storms). They learn a lot about the sea and geography from their grandfather who used to be a ship captain. Ned has cystic fibrosis, his health condition continues to worsen. Despite this, as Jamie will admit, he is the bolder of the twins. Jamie says that Ned is like Captain Kirk, and he is like Dr. McCoy. One day the boys are treasure hunting when they come across a strange sea creature washed up on the beach. The creature is still alive so they hide it in their backpack, take it home, and put it in a water-filled (they add salt too 🙂) tub in the garage. They feed it fish that they have stored in their freezer, and keep it a secret from everyone (remind you of ET?). They are unable to identify the creature, but Ned names it Leonard. Jamie is afraid of Leonard and notices that Ned and Leonard seem to have some sort of connection. This book has themes of hope, denial, acceptance, the unknown, legends of the sea, truth, courage, fear, love, family, and memories. This middle grade novel may not have wide appeal among children, but there will be a few that will appreciate this well-written story and message. I thought this book was going to be about the fish/monster/mermaid the boys found....a good mystery....but it is not. Yes there this merman character but the story is really about the two boys. One is very sick and that is the real focus of the book. Not about the maermaid :-( so there are no thrilling details. Clean language - good for 4/5/6 graders. A little sad at the end b/c you know death is coming. But death does not mean an end, but of a life that was lived and one that should be lived --- I thought this book was going to be about the fish/monster/mermaid the boys found....a good mystery....but it is not. Yes there this merman character but the story is really about the two boys. One is very sick and that is the real focus of the book. Not about the maermaid :-( so there are no thrilling details. Kind of like ET, but even more sad. It was written for kids, but it wrenched my heart. The story is good, but super heart-wrenching. It was hard to rate it higher because of the sadness, and yet it stuck with me, and the writing is really good. As a children's librarian I understand its value. I will carry it in my library, and yet it will be a hard book to offer children as a go-to-for-pleasure reading title. This was so hard to rate. handled the topic of Cystic Fibrosis in a realistic way, which would definitely be beneficial for children who know little about the disease, as well as those suffering with the disease. The story is quite a page turner that I would definitely recommend to someone looking to branch out into themes of loss and bereavement. I cried at page 90 for a while, then i started crying at page 115 and didn’t stop until I finished the book. A beautiful, dark little tale. Perfect for reading on a rainy day when you are prepared to be sad for fictional characters. I would love a story with a character who lives, not dies, with cystic fibrosis but this was a beautiful magical realism story that puts a pleasant spin on death. Gorgeous. Wish I hadn't read it on a plane, sobbing between two uncomfortable strangers. A touching and poetic read. Would be a useful book to educate children about cystic fibrosis and look at themes such as bereavement. The illustrations were also a beautiful touch to go alongside a great story. Great story about brothers, illness and adventure. Sad but moving. It took me some time to get into this book. I didn't feel as connected to the characters as I thought I would by the end. Beautiful and sad and 'very very moving'. It made Billy and I cry. This is a pretty intense middle grade novel. I loved the setting and friendship between these 2 brothers. Quick read for a rainy day. Holy cow, this is up there with A Monster Calls with its ability to rip your heart out. This book is insanely gorgeous and heartbreaking and funny and I will never forget it. This was a very touching and heartbreaking story about two twin brothers, desease, loss and a little hint of magic. Perfect combo to make readers both cry and hope at the same time. Miss Lori read this book. Great story about the love of brothers and some of the weird stuff they do. 5th grade through 7th grade would enjoy this.